DrBen as well as his China Report Staff are continiously engaged in the Search of Sources and the Review of Materials to help describe the City of Beijing. Our Staff is limited, however our Following is Growing each Month. Hence, building on the Online success of The Beijing Report aka Beijing Virtual City, this Page is a new Creation open to all visitors. to help Expand on our Knowledge of the near Timeless but now thoroughly Modern Capital City of The Peoples Republic of China and where possible conrtibute to the (digital) preservation of this Unique, Historic, Grand and Beautiful City!!! Anyone Interested is warmly invited to Help solve the below minor- and major- question regarding Beijing City and surrounding Province. Send an E-Mail to the China Report Staff and Contribute your answers and knowledge ! One of the First Open Questions On Beijing as yet unanswered by the China Report Staff, regardless of efforts, concerns a Historic Photograph. At the Moment this Historic Photo has no source, other than that it was downloaded through Peer-to-Peer Programs over the Worldwide Web. In the Public Space of the Web it goes under the Name: "Altar of the Heavenly God"
DrBen.Net & China Report AUDIENCE to follow Soon ! The Second of the Open Questions On Beijing as yet unanswered by the China Report Staff, concerns this so far unused Photo of Zhou Enlai and Mao Zedong in TiananMen Square during National Day Celebrations. It will be used in our upcoming article on the Historic events that took place in TiananMen Square during its Long History at the (Political) Heart of the Chinese Nation. Link up with US Now ! I am gonna advance my Career in Writing Right Now ! The Third of the Open Questions on Beijing is a Visitors/Viewer/Readers Question regarding the Imperial Palace in Beijing !! It is a rather specific Question asking for Details on the Hall of Preserving Harmony, one of the three Central Throne Halls in The Palace. Help answer this Question, and make one of your Fellow Viewers happy. The Fourth of the Open Questions on Beijing City concerns the Topic of Economic History and the details of Historic Farming Implements. None of our Staff are experts in this subject, but perhaps one of our Viewers/Readers knows more. Please view the Photo taken at the XianNongTan - The Altar of the Earth Park, Sports Stadium and Former Temple with Ancient Altar (Constructed in 1420 AD) in the extreme South-East corner of the Xuanwu District in Beijing and Help us along with some more details and explanation of its working mechanism. Live Streaming Video with DrBen on Report and Photo-Mission in China. Follow the China Adventures from the comforts of your Armchair or Couch using your Computer, TV or Mobile Device ! Play some China Trivia ? Help fill in the Gaps and fill in the unknown or forgotten ! Make a small Name for yourself and outdo- the China Report Staff in historic knowledge. Readers with idea's and suggested information can either E-Mail their answers using the Mail Button on this Page (Use subject -Question/Answer), Leave their Contributions on the DrBen.Net - China Report Blog, or they can twit in- their answers directly using Twitter (user:ChinaReportcom1). The other options are to leave your Item on the China Report Forum (still operational) or to simply publish your own Story Online and sending us the URL - web address at which it is Published. Question number 5 came in November 2009 and regards the Confucius Temple in Dongcheng, Beijing. 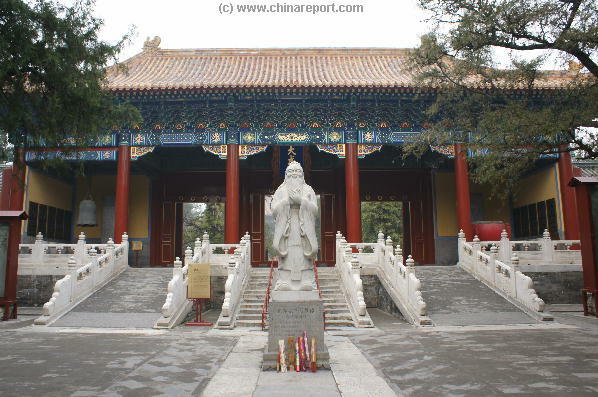 The Question is simple and straightforward: When was the Confucius Statue inside the BJ Temple made, and for what special occasion (if any) was it inaugurated ? Help out a fellow China enthusiast and DrBen.Net visitor !? Send ur answer via twitter or e-mail ! Results will be published with Honors on Site.